Denise Donohue, (left) CRA director, and Ed Noyola, CRA deputy director, give testimony before the Michigan Senate Appropriations Subcommittee on Transportation on Tuesday April 9. Denise Donohue, County Road Association (CRA) of Michigan director, and Ed Noyola, CRA deputy director, today reported to the Michigan Senate Appropriations Subcommittee on Transportation that 88 percent of the new funding received so far by county road agencies has, in fact, been used to improve roads, bridges and rights-of-way. “That’s up from 2,600 miles improved annually before the 2015 road funds were injected. But when we consider there are 90,000 miles of roads under county control, it’s obvious why a second phase of road funding is needed,” Donohue said. County road agencies received their first new fuel tax and vehicle registration fees from the $1.2 billion package in late February 2017, reflecting a partial year of increased funding. Fiscal 2018 brought a full year of fuel tax and vehicle registration fees, which reached approximately $600 million plus legislative supplemental budget revenue. 9 percent toward improving bridges. 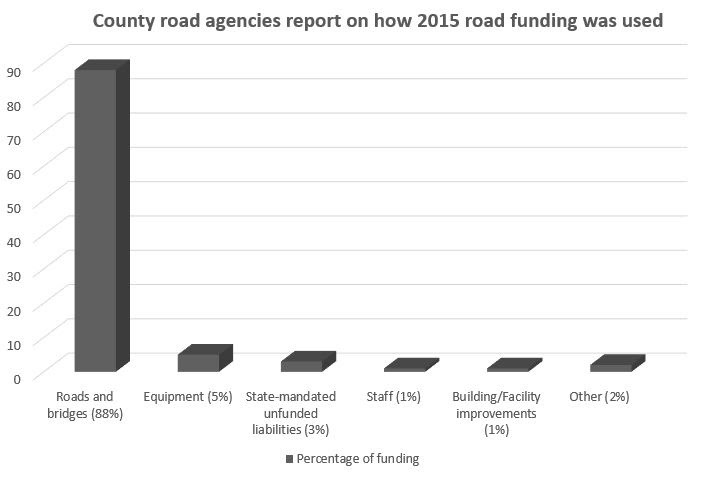 County road agencies also report increasing their match of township dollars, whether a stipend of matching-funds-policy is followed. According to the Transportation Asset Management Council (TAMC), in 2017 a whopping 48 percent of Michigan’s federal-aid-eligible county roads were in “poor” condition. Local roads that do not qualify for federal aid are usually in even worse shape. County road agencies oversee 90,000 miles of roads, which represents about 75 percent of the roads in Michigan – and comprise the 4th-largest local road network in the US. Another milestone in CRA’s report covered the Local Pavement Warranty Program, which has been adopted for all 83 county road agencies and 521 municipalities in Michigan. It was part of the 2015 Transportation Package; CRA reported to the Senate Subcommittee that this project is now complete. It requires every local road agency to consider adding a warranty to any road project with more than $2 million in pavement-related items, and sets out the conditions for warranting asphalt and concrete. The 83 members of the County Road Association of Michigan represent the unified voice for a safe and efficient county transportation infrastructure system in Michigan, including appropriate stewardship of the public’s right-of-way in rural and urban Michigan. Collectively, Michigan’s county road agencies manage 75 percent of all roads in the state, including 90,000 miles of roads and 5,700 bridges. County road agencies also maintain the state’s highway system in 64 counties.